Trump has many faults, listed faithfully by just about any liberal-leaning publication on the net. However, one of the things you can’t knock him for is his dedication to the United States military. After celebrating the passage of the tax bill, he decided to sneak off on Thursday afternoon to pay a Christmas visit to the men and women at Walter Reed Military Medical Center. He didn’t field questions from reporters, but he did let them know that he was off to meet our wounded warriors. 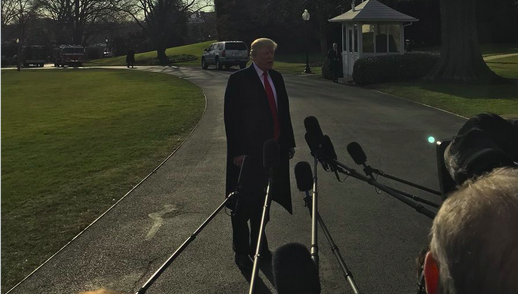 “I’m heading over right now to Walter Reed Military Medical Center to say hello to some of the bravest people anywhere in the world,” Trump said before boarding Marine One. “We’re just going to wish them a merry Christmas, a happy new year and we love those people,” he concluded. He didn’t answer any questions before bouncing out, but what he did there says a lot about who he is as a person. During his visit, Trump also awarded one of the heroes a Purple Heart. 1st Lt. Victor Prato of the 127th Airborne Engineer Battalion was injured after a vehicle-borne IED blast that took place last month in Afghanistan. He suffered multiple soft tissue injuries. I absolutely love this. I am the first to rag on Trump for doing something I don’t deem as being right or conservative enough, because I think that this is Republican’s moment to shine and prove that we really have the better people. That being said, I can’t think of one negative thing to say about this. Nothing. I love how much respect and love he shows our military, our veterans, our wounded warriors, our officers and anyone who is sworn to protect America and her people in any capacity. He truly has a love for this country that I haven’t seen in quite a long time. I love that he is so open about it too. He’s not embarrassed by it, he’s not ashamed of it and he’s certainly not doing it for political points or he would have released the information to the press prior to the visit, so he could make sure that they would be there. This is just wonderful all the way around.